This entry was posted in Uncategorized and tagged Nature, Nature Photography, Photography, Solitude, Thoreau, Walden, weekly photo challenge on February 11, 2017 by The Zen Hiker. Autumn came, with wind and gold. We talk about the disappearance of long warm days that have been saturated by the sun as the “death”of summer. But summer must take leave, like wisps of smoke floating gently from a fading fire. Lush green slowly turns into an umbrella of bright reds, oranges and yellows that breathe new life into a now chilled existence. Natures chaos, its origins unknown, comes sweeping down and transforms the woods, separating the new brilliance from its lifeblood. As the trees sway and moan in protest of a slow eventual death, the leaves fall with the rhythm of lightly falling snow, accumulating on the soft earth only to decay as the sun’s light continues its downward spiral. With brutal awareness, the passage of time will soon bring beloved darkness and the promise of the next season. The beautiful and precious cycle forges ahead. This entry was posted in Uncategorized and tagged autumn, Blog, Blogging, Calm, George Eliot, Mental Well Being, peace, poetry, seasons, summer into fall, Thoreau, Vernon Duke, word press on September 8, 2016 by The Zen Hiker. Heading out into the woods anywhere in the Hudson Valley promises each person a wide variety of trails that are naturally built into each hike. Some are wide and can accommodate several people walking shoulder to shoulder, while others, as seen in the photo above must be traveled in a single file. Hiking on narrow trails, especially when they go on for some length, provide you with a sense of not knowing what it going to come next. Will the trail open up? Will it stay the same? When I venture out and encounter long stretches like this, it feels like being wrapped in a warm blanket. Soft, secure and peaceful. This entry was posted in Uncategorized and tagged Bear Mountain, Blog, Blogging, Blogging about Hiking, Calm, Harriman State Park, Henry David Thoreau Walking, Hike, Hiking Photographs, Hiking photography, Hudson Valley Hiking, meditation, Nature, Nature Photography, Photography, Thoreau, Upper Hudson Valley, weekly photo challenge on July 31, 2016 by The Zen Hiker. Leaving the house, the sun was slowly rising as I made my way around Lake Mahopac. I was amazed at its brilliance, but with no humidity to hinder its ascent, the warm glow basked everyone who was out shortly after sunrise. One of the best things about hiking in Fahnestock State Park is its proximity to where I live. 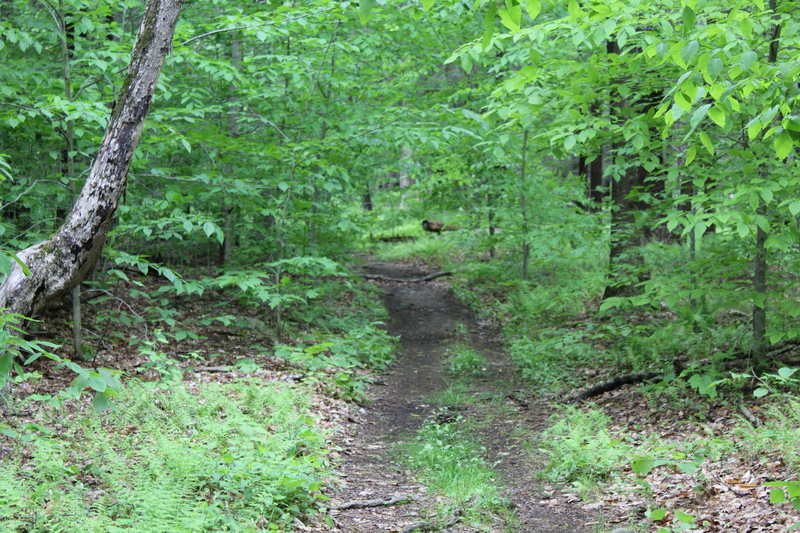 Traveling north on the Taconic State Parkway, it only takes 15 minutes to get from my front door to the trail head. Parking alongside Route 301, the Charcoal Burners Trail makes a hasty retreat into the woods where it meets with the Perkins Trail (Y) about .1 of a mile after you start. Slowly winding its way uphill, the trail snakes its way further and further away from the heavily traveled route 301. If you have never done this hike before, you will be pleasantly surprised when you come out of the woods, turn left and begin walking on grass. It is a welcome change from the usual rocks and uneven terrain that are a staple of every trail. As you walk through the grass, be prepared for your boots to get wet!!! After a short distance you turn right and in front of you will be a gate. Make sure that as you make your way through this area, you stay on the trail as you will be hiking on private property. Instead of being confined to a narrow rocky trail, once you pass through the gate the entire world opens in front you. Breathtaking in its scope, a myriad of photographic opportunities await as you take a moment to reel everything in. As you continue hiking, you will see horses on your left and cows on the right. The trail continues on some really nice terrain, and even though the grass was wet with a cool morning dew, it was somewhat better than the trails we are used to in this area. This was a great place to get some excellent pictures of the surrounding countryside. Without the summer haze that you would expect in mid July, the mountains in the distance were crystal clear. Even more interesting were the tractors, some dead and some alive, that seemed to inhabit the area. They added some nice character to the pictures that you see here. Continuing on the grass, follow the trail markings (not hard to miss) and you will make the hard left turn. After walking for another 10 minutes, you will eventually end up re-entering the woods. As with everything else, all good things must come to an end and the trail picks up exactly where it left off, in the woods. Once you get back on the trail, you will see that it heads downhill for probably about a mile, ending at a small bridge. If you were to do this hike in reverse, you would have a pretty long climb, so if you decide to do this hike, choose your direction wisely! This is also an excellent place to stop and rest for a little bit because you have a small climb ahead of you. After crossing Glynwood Road, the trail heads steeply up hill for approximately 1/4 of a mile and then turns on to a dirt where you will stay until it heads deeper into the woods. As the trail gradually slopes downward, you will see a lake to your right. Now marked by Blue Blazes, this will continue to be the color of the blaze that you will follow for almost the rest of the hike. As the trail winds around the lake, it begins a slow ascent back to the Charcoal Burners Trail where, one mile from the end of the hike, you can rest for a final time at yet another lake. After you rest and get some good photos, cross the bridge and follow the blue blazes until they turn left. You will stay on the red Charcoal Burners trail until you reach Route 301. Overall this hike is 6 miles long. Technically it isn’t a very difficult hike, but it does offer a couple of small climbs that will get your heart pumping. As you can tell by the pictures, it does, however, offer a wide range of scenery that will allow you to get some excellent photos. This entry was posted in Uncategorized and tagged Blog, Blogging, Calm, Cold Spring NY, Fahnestock State Park, Frank Herbert, Henry David Thoreau, Hike, Hiking, Hudson Valley Hikes, Hudson Valley Hiking, Mental Well Being, Nature Photography, Photography, Rosalia de Castro, Thoreau, Upper Hudson Valley, Walking on July 25, 2016 by The Zen Hiker. Even though I briefly touched upon this subject in my first blog, I thought a more concise explanation was necessary. As I was contemplating the merits of writing a blog about my journeys throughout the Hudson Valley, I found myself conflicted. Conflicted about what you may ask? How could I possibly have an issue with writing about my favorite (and maybe not so favorite) hikes? Well, It seems as though many of the hikes in the area were relatively unknown until they either appeared in a magazine, newspaper or blog. After people read about them, all of a sudden they became the place to go. Whereas in the past, even on a weekend, many excellent hikes that never had many people were now packed to the gills. A classic example of this is Breakneck Ridge. Ever since it was voted the #1 hike in North America, it is now inundated with hikers every weekend and holiday. When I say inundated, I don’t mean a small trickle of folks. I really mean a swarm of people from places as far south as New Jersey and well into Dutchess county and north. It even now has its own tiny Metro North station! You used to have to walk to the Ridge from the Garrison station a couple of miles away. A good friend of mine who I have been hiking with for over twenty years, used to love to hike Breakneck Ridge. When he does go now, he says that the number of people has multiplied exponentially and with it the amount of trash, poor behavior and destruction to the trail. So I thought about and I had to make a decision. If I write about the hikes I love, would I also be contributing to the demise of the places I go to reclaim my sanity and zen? I decided that it would be better to share the hikes I love as well as why I love them and hope that others will treat every trail with the same amount of affection and reverence that I do. Anyway, if I decided that I wouldn’t write about my experiences hiking in the area, what would I write about? This entry was posted in Uncategorized and tagged Blogging, Breakneck Ridge, Hiking, Hudson Valley Hikes, Thoreau on September 20, 2015 by The Zen Hiker.